Amsterdam, 1659. On the world’s first commodities exchange, wealth is won and lost in an instant. Miguel Lienzo, a crafty trader in the city’s close-knit community of Portuguese Jews, knows this too well. Once among the most envied of merchants, Miguel has lost everything in a sudden shift in the sugar markets. Impoverished and humiliated, living on the charity of his petty younger brother, Miguel would do anything to change his fortunes. 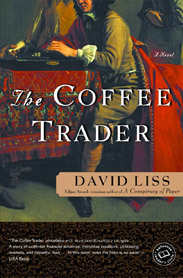 Flouting the rulings of the Ma’amad, the restrictive and mysterious governing body of the Jewish community, Miguel enters into a partnership with a seductive Dutchwoman who offers him one last chance at success – a daring scheme to corner the market on an astonishing new commodity called coffee. To succeed, Miguel will have to risk everything he values and test the limits of his commercial guile as he faces not only the chaos of the markets and the greed of his competitors, but also a powerful enemy who will stop at nothing to see him fail. And he will learn that among Amsterdam’s ruthless businessmen, betrayal lurks everywhere and even friends hide secret agendas.